Days after millions of workers in California and thousands in Pennsylvania won historic pay increases to $15/hr and amidst ongoing negotiations for $15/hr for millions more in New York, the unstoppable momentum for $15 and union rights continued to build as underpaid workers across the globe said they would wage the biggest-ever day of strikes and protests on April 14. Fast-food workers will go on strike in a record 300 cities and tens of thousands of underpaid workers—including home care, child care and higher education workers—will lead hundreds of protests from Manchester, NH to Memphis, Tenn. to Marina Del Rey, Calif. Around the world, workers will join in, with protests expected in more than 40 countries on six continents. American families are being forced to scrape by because big corporations are ripping off workers, ripping off taxpayers, and ripping off communities. To get richer and richer, big corporations manipulate the rules to avoid paying fair wages and their fair share of taxes, forcing working people and taxpayers to foot the bill. As a result, workers and communities are being starved of the money needed to build a bright future, and left with impossible choices over how to care for their children and elderly parents and how to meet their basic expenses. 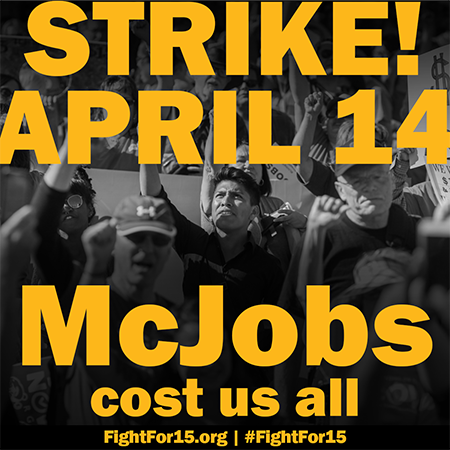 The workers’ protests, timed to hit just before Tax Day, will zero in on McDonald’s, highlighting how the world’s second-largest employer and the industry leader in the fast food and service economies is driving a race to the bottom that is undercutting wages across the economy and resulting in nearly 64 million workers being paid less than $15. The workers will also highlight how McDonald’s tax avoidance around the globe hurts governments, workers, taxpayers and consumers.